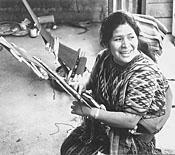 Guatemalan Maya women are highly skilled weavers. Their textiles, created using the backstrap loom, are known worldwide for their excellent workmanship and design. Their weaving skills have been passed down from mother to daughter since ancient times. Not only are the designs and colors of the Maya textiles attractive and unique, they also carry the history and traditions of their communities. This illuminating documentary explores the lives of Maya women today, portrays their ancient weaving processes, and examines the economic, political, and cultural forces that are profoundly affecting the women and their weaving. “Daughters of Ixchel” will generate discussion in a wide variety of courses in cultural anthropology, Latin American studies, women’s studies, and the arts and humanities. It was produced by Kathryn Lipke Vigesaa and John McKay.